May 2012 | Blog | Di Bruno Bros.
Want to try a great twist for a cheese burger? How about some fresh Buffalo milk mozzarella melted on top! Instead of the traditional hamburger roll why not put it on a nice flaky, buttery French croissant? Here we go! Summer is almost here. Visions of backyard cookouts and weekends at the New Jersey shore come to mind. Our Catering Department is always thinking of new ways to offer you gourmet eats for a good price for any occasion! Summer is the perfect time to acquaint yourself with our catering offerings. Memorial Day weekend marks the unofficial kick off to the summer season. It’s the perfect opportunity to bring family and friends together for a fun summer party at home! 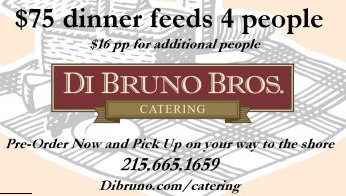 Let Di Bruno’s Catering help make planning your Memorial Day party a breeze! Di Bruno Bros. is once again proud to be supporting and participating in the 2012 Italian Market Festival on May 19 and 20. This celebration of all things Italian, and the nation's largest outdoor market, draws large crowds every year from all over the city and region. Grilled cheese is a simple dish that can be as easy as American singles on Wonder Bread. However, here at Di Bruno Brothers we have a little saying that goes; “Why WouldJa Do That?” If you have stumbled upon this blog, that means you have access to some of the finest food on the planet. Exercise your right to be well fed. If you ever want to see a pageant involving knives, muscles, and cutting boards, book a trip to Long Island City for the Cheesemonger Invitational (CMI) on June 23, 2012. Now in its third year, the event draws makers, mongers, and rabble from the cave to compete for cash prizes and a chance to throw down against the best in the business.